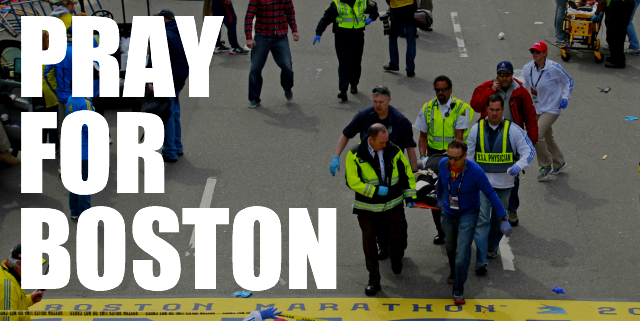 As investigators search for answers, the people of The United Methodist Church offer prayer, comfort and resources for healing in the aftermath of Monday’s bombings at the Boston Marathon. 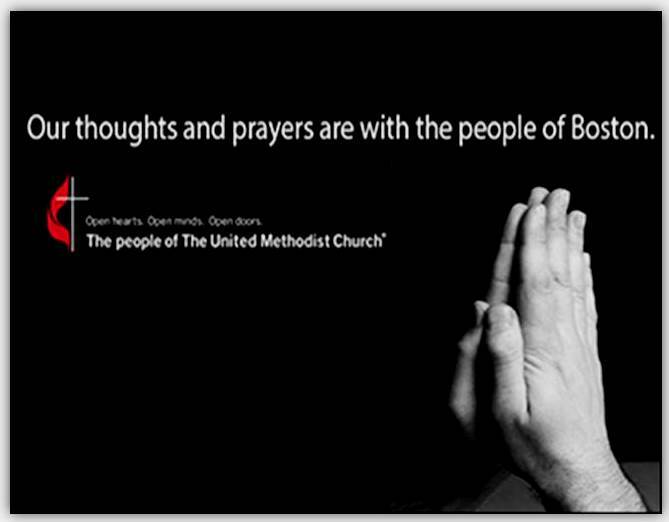 Click here to read more from United Methodist Communications. Bombing provokes prayers and the search for answers. Prayers require no press conferences with platoons of experts. Prayers require no cellphone connections. They just fly from our mouths to God’s ears. In the aftermath of the Boston Marathon attack, the voices of faith -- from the pope to pastors across the country to the millions unnamed who turned to God to petition for healing and comfort -- are asking the eternal question: Why? Pope Francis sent word Tuesday morning to Cardinal Sean O'Malley, archbishop of Boston, that he was "deeply grieved" by the attack. The Vatican said Francis "invokes God's peace upon the dead, His consolation upon the suffering and His strength upon all those engaged in the continuing work of relief and response." Francis also prayed that all would be "united in a resolve not to be overcome by evil, but to combat evil with good, working together to build an ever more just, free and secure society for generations yet to come." His words echoed Cardinal O'Malley's own statement of deep sorrow and prayer issued Monday night. In addition to his words of comfort for all touched by the death and injuries, O'Malley praised the first responders and the citizens of the city and the region for their "bravery and heroism." Christian believers would find help and hope in Christ and "stand in solidarity with our ecumenical and interfaith colleagues in the commitment to witness the greater power of good in our society and to work together for healing," Cardinal O'Malley said. Ed Stetzer, a Baptist pastor and president of LifeWay Research, a Christian research agency based in Nashville, blogged Monday that the tragedy drives us to cry out as the it says in the Bible, "Come quickly, Lord' and set things right." Stetzer shared words from Boston area pastors such as Brandon Levering, pastor of Westgate Church, Weston, Mass, who devoted a blog post to defeating the fear instilled by terrorism. "…There is one thing on earth that no bomb can shake, and no terror can overcome: your presence… As our city quakes from the effects of sin in this world -- the evil, the violence, the injuries and loss of life -- we pray that your holy and healing presence would be made known," Levering wrote. The troubling, persistent, demanding question of "Why?" is also addressed by Adam Mabry, pastor of Boston's Aletheia Church. His answer is the same as Levering's - sin. "All of us--friends and enemies, kings and peasants -- are touched and marred by this reality," Mabry said. "What are we to think when tragedy mingles with beauty? When pain accompanies grace? When blood spills with tears?" asks Mabry, who offers the Christian answer of turning to Jesus. "I'm praying for my city. 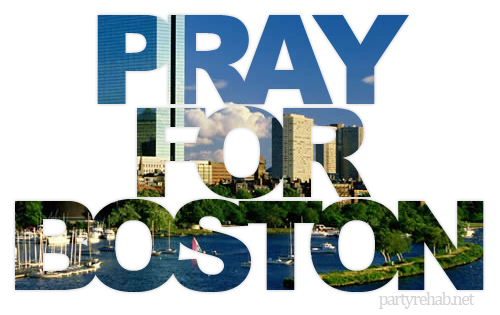 I'm praying for the victims. I'm praying for the first responders. I'm praying for families. But most of all, I'm praying for that grace which comes from God alone to overcome all that besets her." Jewish voices also spoke of prayer and gratitude for human goodness. Benjamin David, rabbi of Adath Emanu-El in Mount Laurel, N.J., and Rabbi Scott Weiner, senior rabbi of Temple Israel of New Rochelle, had just completed the marathon on Monday before the blasts. The rabbis are co-founders of The Running Rabbis, which encourages clergy and congregants to run for charity, and they ran for the Dana Farber Cancer Institute. "Tragedy reduces things to the most primal and most important factors," David said. "Family, friends, community and what strangers need help." 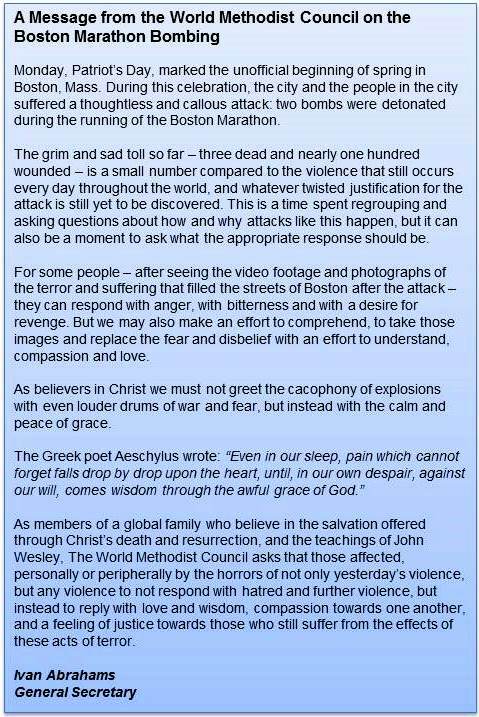 Laura Barrett, executive director of the Massachusetts Council of Churches statement quoted Jeremiah 33:6: "Behold, I will bring health and healing to the city; I will heal them and reveal to them the abundance of peace and truth." Her statement, echoed by the National Council of Churches in their release Tuesday, also included prayers to "preserve us from quick judgments" and for the strength to be "steadfast in charity, defiant in hope, and constant in prayer." Barrett included words from the African-American spiritual, Guide my feet, "Guide my feet while I run this race, for I don't want to run this race in vain. **Cathy is a reporter for USA Today.